Network Functions Virtualization (NFV) takes network functions that were previously only possible using highly customized hardware and software, and allows them to be implemented totally in software on generic commercial off the shelf (COTS) networking devices or in the cloud. These functions can then be centralized, usually in a data center for much easier and more cost-effective deployment. Speed to service delivery is what Network Functions Virtualization is all about. It changes the service delivery landscape for both Service Providers and Enterprise IT with the potential to shorten the delivery of services from months to days or minutes. Sometimes the network functions need to be located at the edge of the network, typically on a customer premises. This could be to measure operations, administration and management (OA&M) functions, such as end-to-end packet loss or latency; security function such as encryption; or WAN optimization functions, such as software defined WAN; or functions to support resilience or performance, which are affected by location in the network. In these cases, Distributed NFV (D-NFV) , service providers deploy an Ethernet Access Device (EAD) equipped with Network Function Virtualization Infrastructure (NFVI) to the customer premises that includes the necessary x86 server hardware and base software to host VNFs. This allows service providers to offer new services in an instant, initially provide Ethernet Business Services (EBS), and then offer value-added network services hosted on the same platform that leverages the EBS to download, update, scale up/down, and manage the various hosted network services. For example, a service provider can install an EAD equipped with a server, turn up an EBS, and then download a virtual router, firewall, and encryptor quickly and securely. While the benefits of NFV and D-NFV are clear to equipment vendors and service providers, a recent study from Ovum, commissioned by Ciena, shows that enterprise IT is not yet ready to adopt the technology wholesale. 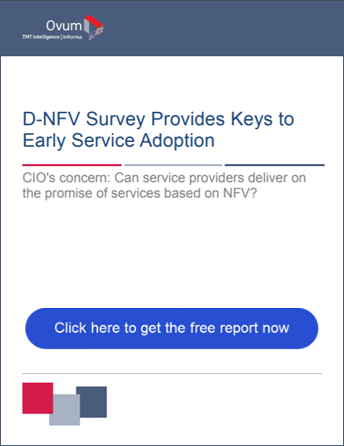 While almost two-thirds of the 209 enterprise respondents reported a strong understanding of NFV, and more than 95% claiming some awareness, service adoption is still low, with only 42% using or trialing service and the remainder adopting a wait-and-see approach. The survey also showed that what may be holding back adoption is enterprise IT does not see the service provider's role in delivering fully managed services based on NFV technologies. Instead, enterprises reported hearing about NFV-based service more from network equipment vendors than from service providers. For example, enterprise IT did not express a preference for distributed versus on-premises location of features, possibly due to a lack of understanding of where some functions are more securely hosted, which seems to leave this decision to the service provider. In addition, the value of distributed versus centralized VNFs was reported to be less important to the overall value of the VNF itself. In short, enterprises don't care where their VNF is located, as long as it performs well and is priced right. This a tremendous opportunity for service providers to articulate the value proposition of D-NFV to address key user pain points, which center around network flexibility, visibility, and control. 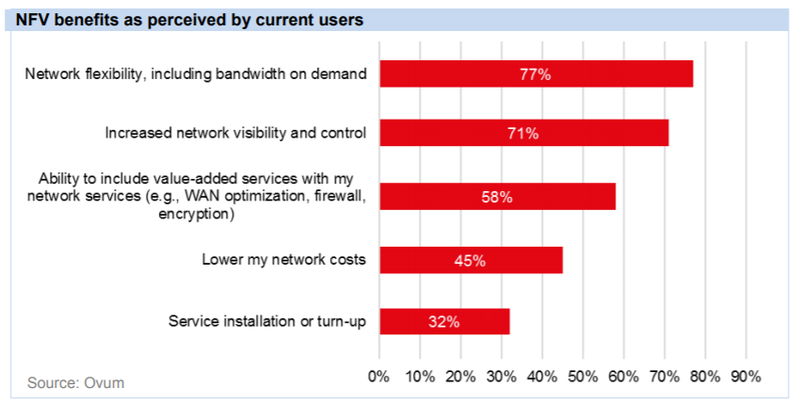 Survey respondents said they are more concerned with network functionality first and then will look for these other benefits, such as cost, self-service, and faster installation, which ranked lower in priority (Figure below). Defining their role in the service value chain – service providers need to better promote and market their involvement in testing, packaging, and delivering NFV services as fully managed solutions. As enterprise IT starts to see and understand the service provider's role and the expected benefits, they value and trust service providers as their NFV services delivery partner. Show real value for NFV services – service providers should aggressively approach existing and prospective customers when launching new NFV services, highlighting that these are managed services that remove the complexity for customers and lessen the need for internal staff and technical knowledge. Develop service customers want – if Enterprise IT is looking for greater network flexibility, more visibility, better performance, lower cost, better security, and more control, then service providers must ensure the services they offer match these requirements. Differentiate from competitors - service providers need to develop a fully managed solution that provides visibility and control but also leverages their own experience and staff in managing complex network services and technology. Sixty-five percent of respondents said they were looking for new network services from a new provider, proof there is a great opportunity for service providers that can differentiate and address customer expectations. As the study concludes, Enterprise IT is “looking for the service provider to be the trusted advisor in the deployment and implementation of NFV-based services.” D-NFV is a big opportunity for Service Providers who seek to position themselves as a trusted managed services partner who can relive Enterprise IT of their networking challenges, allowing them to focus on their core business.